Oh What A Difference Three Decades Makes! For part of the 1970s and early 1980s I worked at an office at 4th and Spring in downtown Los Angeles. During that time I witnessed a shooting, stepped over a dead guy in the parking lot one morning (the cloth draped over him was a dead giveaway) and was pretty much just happy to get the hell out of there every night without injury. Who knew that three decades later this area would suddenly become a hip area to dine out and drink…but it is. Recently Tracy and I met our friends Steven and Adelaide at one of the hippest of the hip joints in L.A., Bäco Mercat, near the corner of 4th and Main (in days gone by, this “old bank district” made Spring Street an avenue of magnificent buildings, before it fell into disrepair in the early 80s). It’s now so hip that to get reservations at Bäco Mercat on a Saturday night near the time we wanted to dine, we had to make reservations about five weeks in advance. Josef Centeno, who was previously the chef/owner at L.A.’s Lazy Ox (another great L.A. find), opened Bäco Mercat in 2011 (he also was executive chef at Meson G and Opus in Los Angeles). 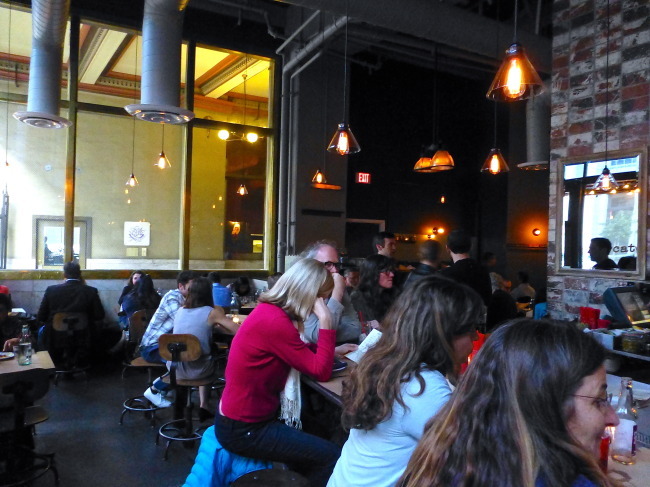 We had heard mixed reviews on Baca Mercat, but it’s always fun to try new places. 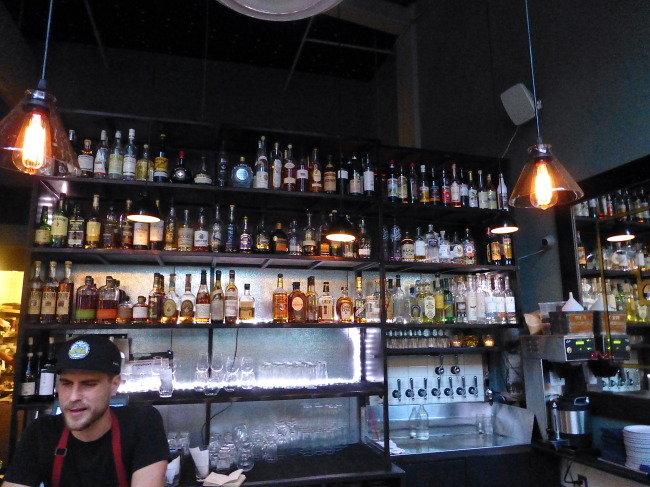 Walking in to Bäco Mercat, you’ll notice two things…a large bar and a lot of noise. It’s another of those L.A. places that looks like they just hollowed out an old warehouse and put in a restaurant. Urban dining is what I believe the chic like to call it. We had 6:45 reservations, but the place was packed so we bellied (well as close as we could belly) to a very crowded bar for cocktails. Fortunately it was Steven’s turn to buy before-dinner drinks. Adelaide ordered a glass of Chardonnay ($13), Tracy and I each had a great Manhattan in cool retro glasses (I think they were also $13) and Steven a glass of 10 year-old Springback Scotch ($15). Fortunately, when our name was called there was a table outside so the inside noise would not have any effect on conversing or trying to figure out the unique menu. It was a pleasant evening, but the heat lamps were still on low for we wimpy Californians. This is another of the “newer” restaurants where “sharing is encouraged.” There are lots of small plates, and also some larger ones, but the four of us were in a sharing mood this night, so we stuck to small plates. We also splurged a little on wine because Tracy had a $100 gift card. 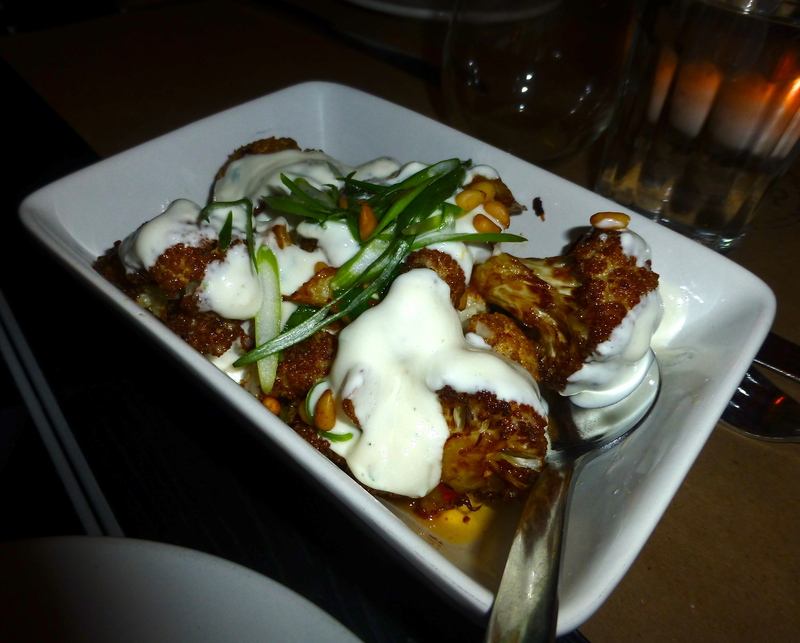 The first dish we ordered was the caramelized cauliflower with pine nuts, mint, garlic and lebni ($9). It seems many restaurants now include terms and ingredients I’ve never heard of, and lebni filled that bill. From a the all-powerful and all-knowing internet: “Lebni is even richer and creamier than Greek yogurt, with a consistency more like sour cream. But unlike sour cream, Lebni is made with live cultures, which means that it contains all the healthy probiotics that you hear so much about these days. And, the taste of Lebni is less bitter than sour cream, so overall it has a wonderfully smooth and balanced flavor.” Whatever the hell it was…it was very good. 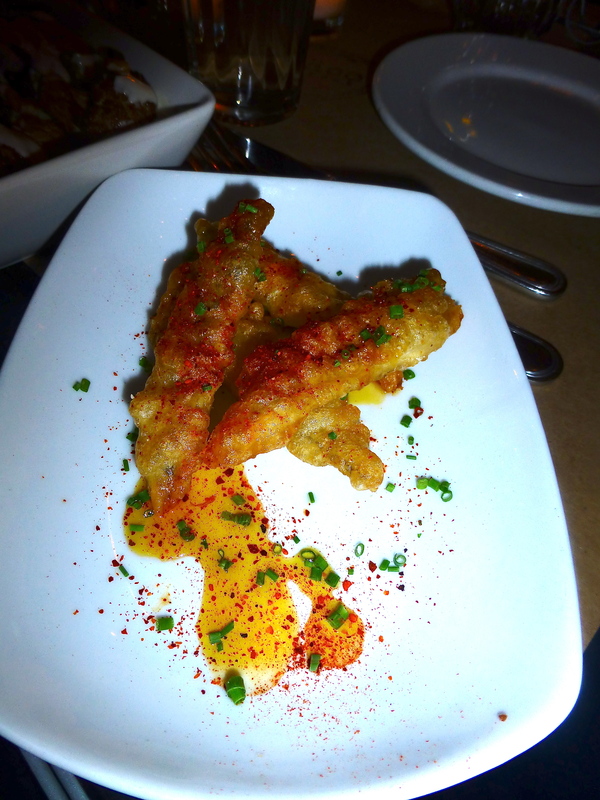 Next out of the chute came our bouquerones with saffron, honey and espelette ($7). None of us knew what half of that meant, and as it turned out bouquerones (cured anchovies are a common appetizer in the south of Spain (where we’re headed next year) and the espelette is a variety of chile pepper. When we were in Rome about five years ago, Tracy and I fell in love with Romanesco, a wild broccoli thing that looked like it was on steroids. 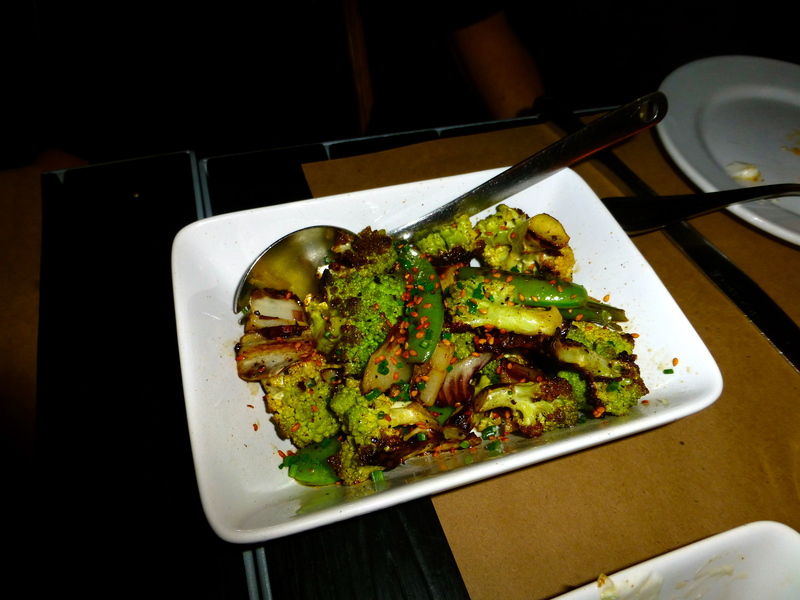 Our next shared plate was roasted romanesco with treviso, white soy and garlic (($12). It was outstanding. 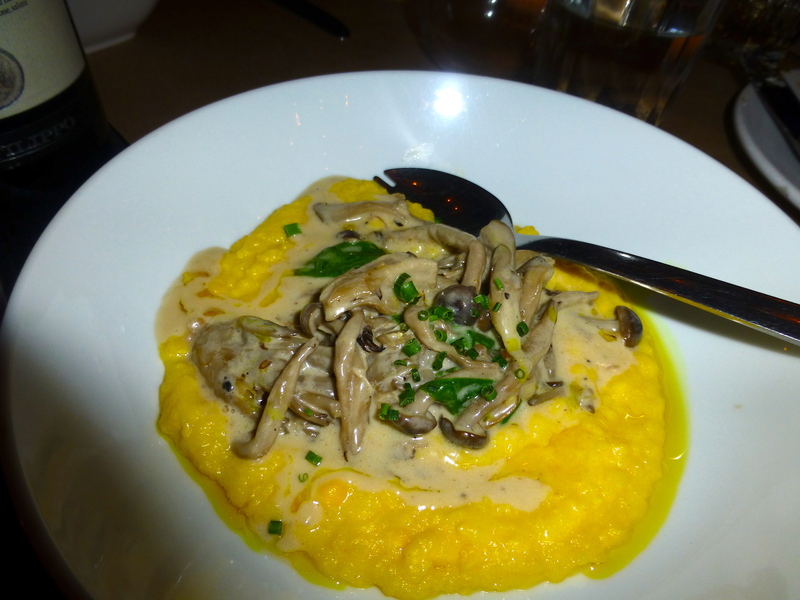 Our final appetizer was fresh corn polenta with maitake, shimeji and curry oil ($15)…very good. Adelaide said she would like something with an egg on top, and we followed those wishes. First out was a dish with the appetizing name of The Salty Jowl, guanciale, tomato, taleggio and the aforementioned fried egg on flatbread ($16). 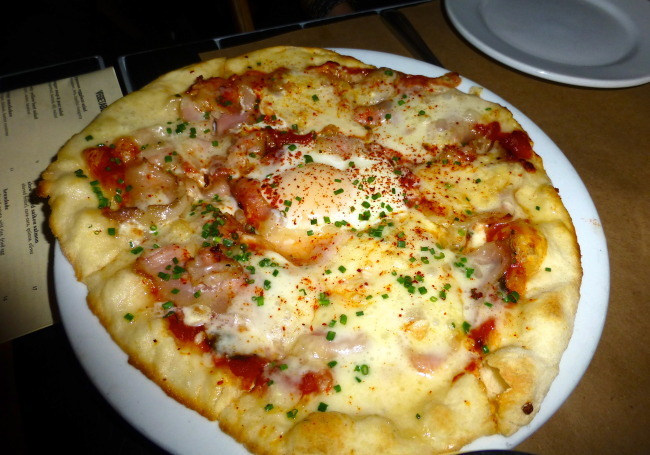 I found out afterwards that guanciale is “an Italian cured meat product prepared from pork jowl or cheeks,” and that taleggio is “a semi-soft, washed rind, smear-ripened Italian cheese.” I’m going to need a dictionary to dine out from now on. 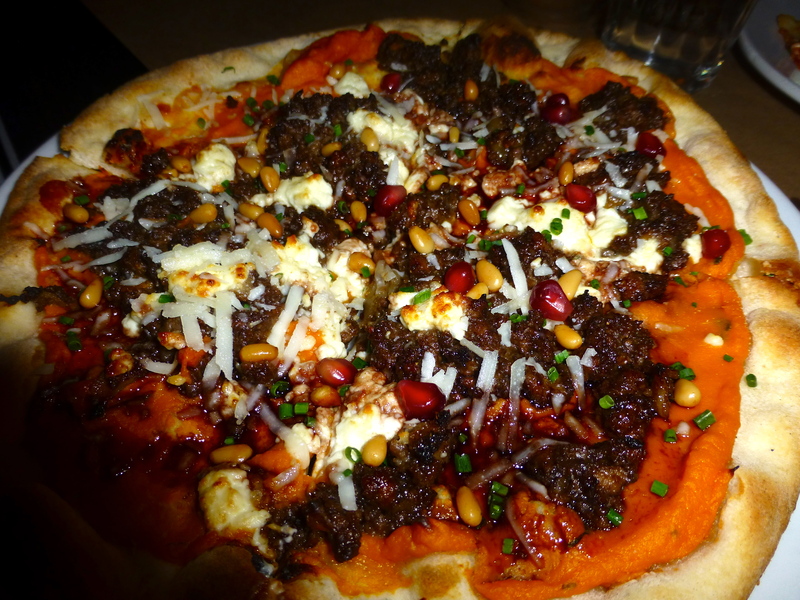 Our other “Coca” was another winner; the Carne Picada with spiced beef, yam, pine nuts and goat cheese ($13). Not only did it taste good, but I didn’t have to look up any of the ingredients either. By now reading was tough anyway since we were more than half way through our second bottle of a 2010 sangiovese/barbera/sagrantino montefalco rosso di filippo umbria ($52). 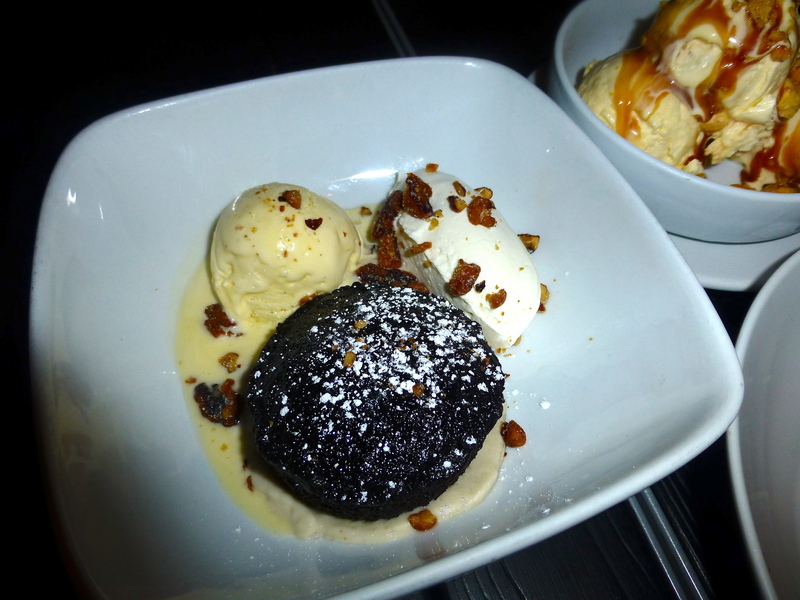 To help us finish the final portion of that vino rosso, we split some desserts. 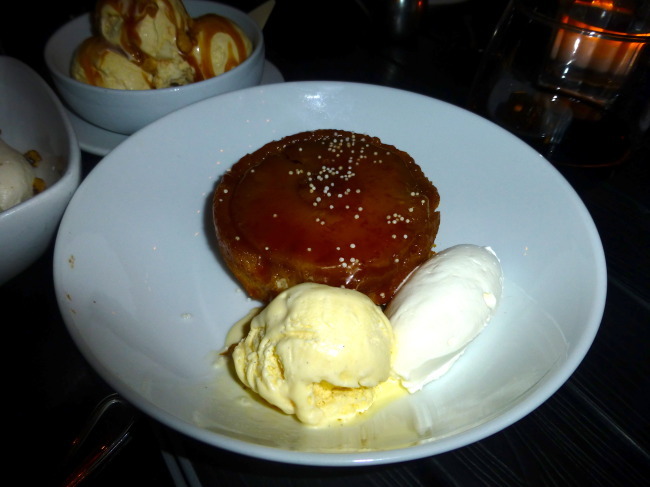 We felt the desserts were the weakest part of the meal. 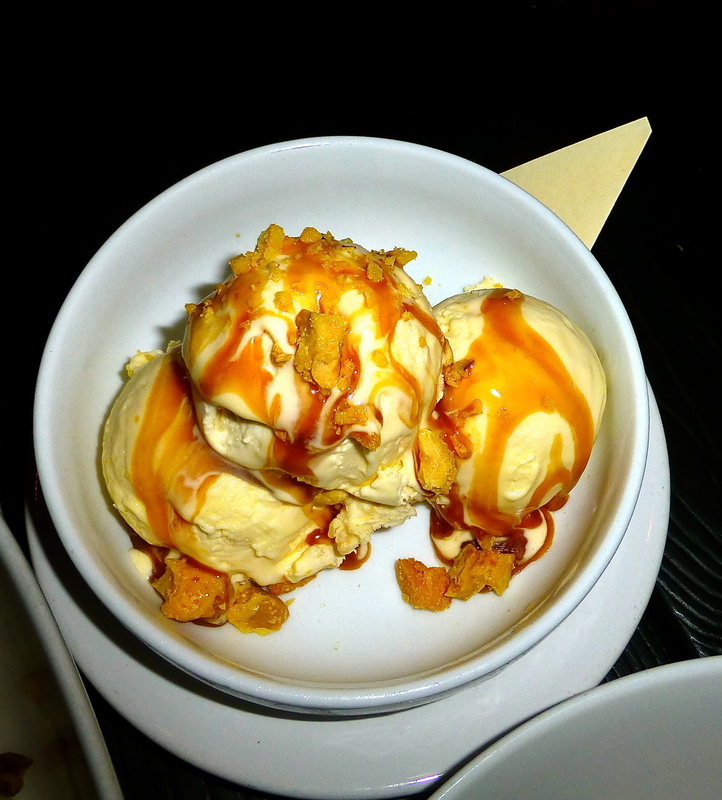 The caramel semifreddo and pineapple upside down cake were both ok, but Adelaide’s chocolate-peanut butter cake left much to be desired…like where was the peanut butter? Our bill for four came to about $240, but nearly half of that was wine (and with that extra 100 bucks off our bill…thanks to the gift card…the total came to a much more palatable $140). Centeno has opened two other restaurants in the past couple of years. Bar-Amá is Centeno’s take on Tex-Mex, and he also opened the more eclectic Orsa & Winston. 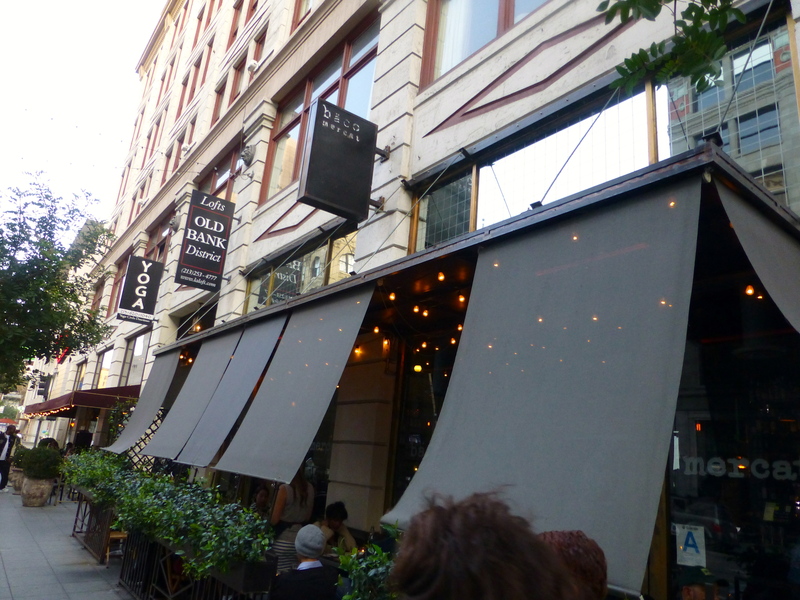 We liked Bäco Mercat enough, but with so many other interesting downtown places I’d like to visit, we probably won’t return soon, but I could be talked into it. Dinner was good. Dessert…well, not so much. 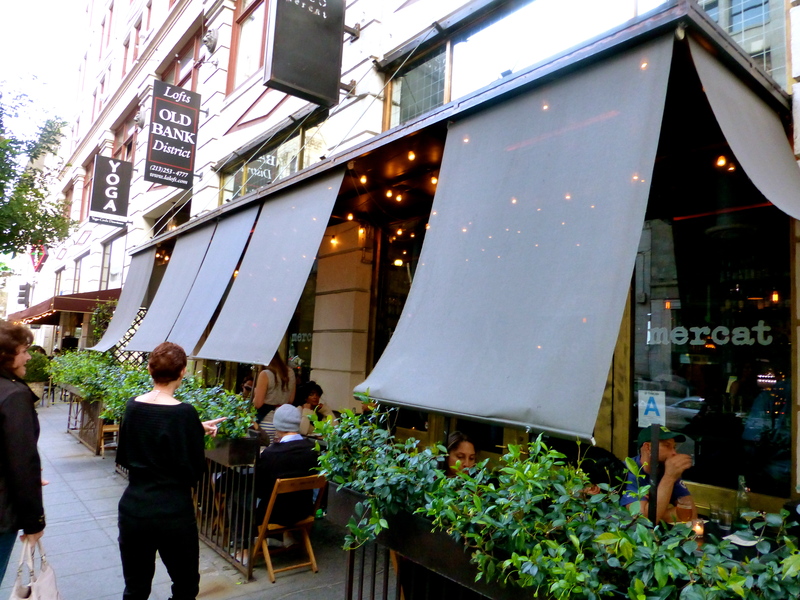 I also doubt that I would like to sit inside…just too loud for my taste (but not nearly as bad as the nearby, and very popular, Bottega Louie) . However, I would certainly recommend Bäco Mercat for its inventive cooking. In addition, the servers were all pleasantly attentive and, most importantly, there were no dead guys to step over on the way in. Hours: Monday – Thursday 11:30 a.m. – 2:30 p.m. and 5:30 p.m. – 11:00 p.m.
Sunday 11:30 a.m. – 3:00 p.m. and 5:30 p.m. – 10:00 p.m.